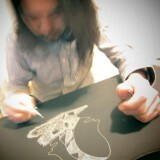 Cherry aka Teruyuki Kurihara is a music producer and drawing artist from Japan (Chiba, Boso) born in 1979. He started his solo project 'Cherry' mainly focused on electronic music in 2007 after experienced playing in some bands. Since his first EP 'The Alex EP' was released in 2009 from the label ‘Four:Twenty’ based in Bristol, he has released good music from home and abroad. He spent his time in Australia, Thailand, England and Germany from 2012-2014 with playing his live set eagerly and that experience inspired him to start drawing. We can describe his style as ’marvelous and elaborate lines in minimal design’. Soon curators in Berlin have started paying attention to his art and he had joined to some group exhibitions. After coming back to Japan, he has drawn illustrations for the series ‘Monoklo’ of the label 'Holic Trax' running by Tomoki Tamura. In addition, he has exhibited and done live painting at some festivals like Re:birth and Rural, he has been expanding his artistic horizons including both music and drawing art.